We’ve heard patients say things to us like, “I wish I had a movie star smile, but it’s not for me I guess.” For some reason, people think they don’t deserve to have the same flawless smiles that they see on magazine covers or that those celebrities were born with picture-perfect smiles. At Edgewood Dental, we offer a variety of cosmetic dentistry solutions that will get your smile camera-ready and give you the confidence to smile broadly in every photo. Contact us in Michigan City to schedule an appointment. Our team welcomes patients from Trail Creek, Pottawattamie Park, and other nearby communities. At Edgewood Dental, we want to replace lost tooth structure and restore proper function, but we also believe that restorations should look beautiful. That’s where smile repair options like metal-free, all-ceramic crowns and bridges come in. They offer our patients an unbeatable combination of flawless appearance and long-lasting restoration. Made from only the highest quality materials, these metal-free restorations can be used to repair damaged teeth or to improve the overall appearance of the smile. Additionally, metal-free restorations are the option best suited to patients who have metal allergies or sensitivities. Perhaps best of all, we can use our CEREC system to design, craft, and place a quality all-ceramic restoration in just one appointment, saving you time and allowing you to leave our office in one day with a beautifully renewed smile. If you’re one of our many patients seeking to brighten their smiles, we can help! 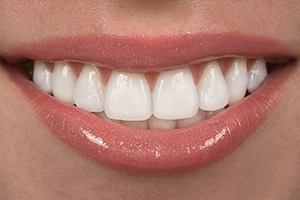 At Edgewood Dental, we offer both in-office and take-home teeth whitening services. Combining professional, customized doses of the active whitening agent with safe, effective application methods, we help patients achieve results up to ten shades brighter. 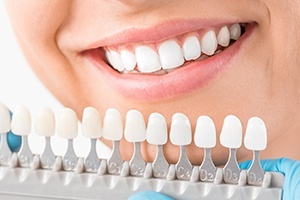 If you’d like to brighten your smile right away in preparation for an upcoming event or you’d prefer to leave all the dental work in our capable hands, in practice whitening might be for you. If you have sensitive teeth or want to brighten more gradually, we may recommend take-home whitening kits. Regardless of your chosen method, we’ll help you achieve the brighter smile you desire. Porcelain veneers are a great cosmetic solution for patients who have numerous cosmetic flaws across several teeth. As the word veneer may imply to you, this treatment is completed by placing thin sheaths of dental grade porcelain onto the front facing surfaces of teeth effectively concealing any chips, cracks, stains, or gaps. The process is completed over the course of two appointments. 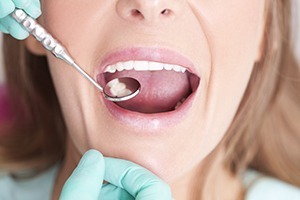 During the initial visit, we prepare teeth, capture impressions, and place temporaries to protect your prepared smile. When our dental lab is done crafting your custom restoration, you’ll return to our office to exchange the temporary for your flawless porcelain veneer. Want to get all of the aesthetic benefits of porcelain veneers in less time and for half the price? With pre-made composite-resin based Componeers®, our team can quickly eliminate flaws such as stains, chips, cracks, and gaps in just one easy visit. After examining your smile, you and our team will select thin composite coverings to bond directly to your teeth, and once applied, they’ll give you the beautiful, uniform smile you’ve always wanted. 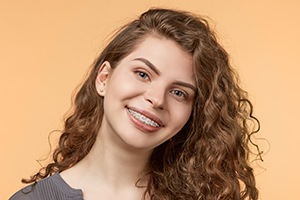 A straighter smile is something many of our patients want, but people often believe they have to rely on a traditional metal bracket and wire braces to achieve their desired look. Fortunately, we have a better offer for Edgewood Dental patients - Invisalign® Clear Braces. Rather than brackets and wires, Invisalign® Clear Braces uses a progressive series of clear, plastic alignment trays to gently shift teeth into their ideal position over the course of about twelve months of treatment. Each set of aligners represents one step closer to your desired smile. When you insert the alignment tray, the pressure is exerted on the teeth. After about two weeks of daily wear, you can exchange the current set for the next in the series, so you see dramatic results without dramatically impacting your overall appearance. For adult patients with minimal crowding, alignment issues, or large gaps between teeth, Six Month Smiles® may be a great orthodontic solution. As the name indicates, treatment plans are typically completed in three to six months. This process is completed more quickly than traditional orthodontics because it focuses on just the front facing teeth, those that are visible when you smile. While not typically recommend for younger patients, Six Month Smiles® can be ideal for adults who need minimal orthodontic correction. In addition to the abbreviated wear time, Six Month Smiles® braces also use clear and tooth-colored materials, making them less noticeable.